How to find the new weapon and what to expect when you've bagged one. Our Fortnite Scoped Revoler guide outlines the new weapon's stats and the locations where you can find it. Tips will be added after the patch goes live. A new weapon - the Scoped Revolver - is about to hit Fortnite with the imminent release of Patch 7.20. This is, as you'd expect, a pretty standard side-arm, albeit one with the unique added precision of a scope so you can land your shots a little more cleanly. In our guide to the new weapon we've pulled together everything we currently know about it, from its stats, to its whereabouts on the map if you want to grab one for yourself and give it a go. Once we've had a chance to play around with the gun on the live servers we'll be adding in tips and gameplay video which should help you get a headstart. No sniper? No problem! Use the new Scoped Revolver to hit precise shots against enemies. 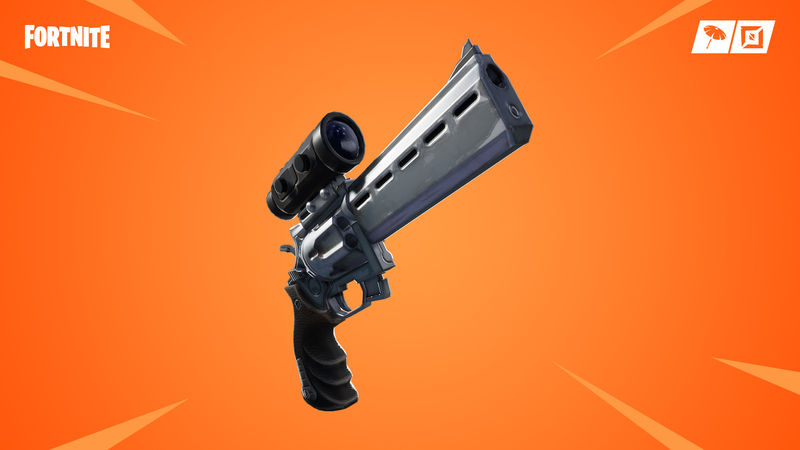 The Scoped Revolver is available in both Epic and Legendary versions. As for the damage numbers, the Epic version inflicts 42 damage per shot, which increases to 44 damage with the Legendary edition. Both variants of the Scoped Revolver fire Medium Ammo. Where can you find the Scoped Revolve though? So, your best bet for locating a Scoped Revolver is probably to hit the chests hard and hope for a little luck. Keep a keen eye out for the loot around fallen players too, just in case they've been luckier than you in their hunt for the new gun. As soon as the new patch actually goes live and we've had some hands-on time with the Scoped Revolver, we'll add in tips for getting more out of the new weapon. We'll also drop in some gameplay video when it becomes available, so you can get a better feel for how the Scoped Revolver works in a live environment.